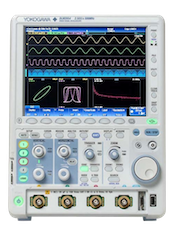 The DL series instruments are capable of measuring the delay between traces or the delay between channels. The measured output value can be displayed in either time or degree. Please download the attached PDF file for a detailed example of how to measure delay. Note: For non-triggered ROLL Mode with a T/Div ≥ 100 ms/Div, you will need to press STOP to display the delay measurement.